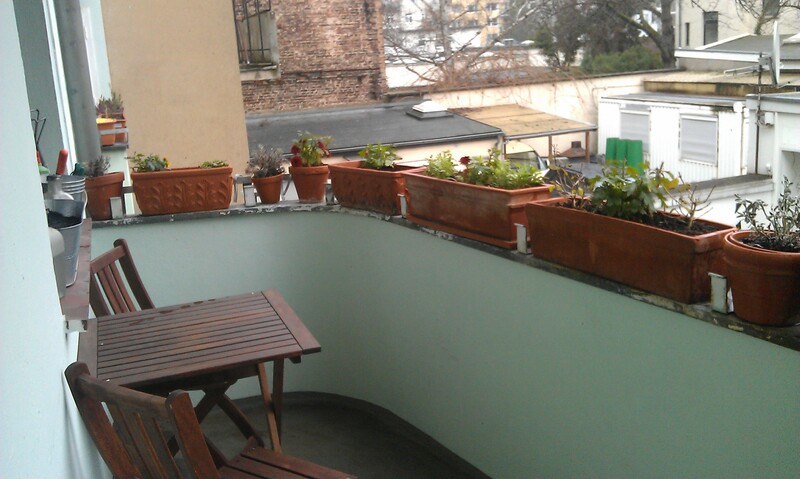 Today I did something I should have done months ago: I cleaned up my balcony (not planting though, it is just too early in the year to opt for spring flowers outside yet). As it tends to happen with unused spaces we were starting to pile empty bottles on it every now and then. What ever needed to go out of sight for a while, was not sensitive to rain and found no other space in the flat which is with 65sqm not really that big, was stored at the balcony. And all the flowers were just not looked after. Many autumn plants had died already in the short cold period when we had snow in early December. Others like the chrysanthemums liked the unlikely warm weather (today we are at 9°C) and started blooming again. So I started cleaning up, doing a long needed winter cut on my two lavenders and the hydrangea. I threw out chives, parsley and mint as well as the left overs of the different basils and cut back the rest of the herbs (not sure if the salvia will make it, but we’ll see). Then I cleaned out everything else that was rotting on my balcony and cut back the chrysanthemums. In the end I realized I had two completely empty flower boxes and sowed some normal and some corn salad. If the weather stays as spring-like as it is now (actually it would be normal if it was around 10°C colder) that should work out just fine and we will have fresh salad from the balcony in a few weeks. Well, now everything is ready for spring and, fingers-crossed, if nothing unexpected happens, I won’t need to do much on the balcony until I can plant the first spring flowers in about 2 months. 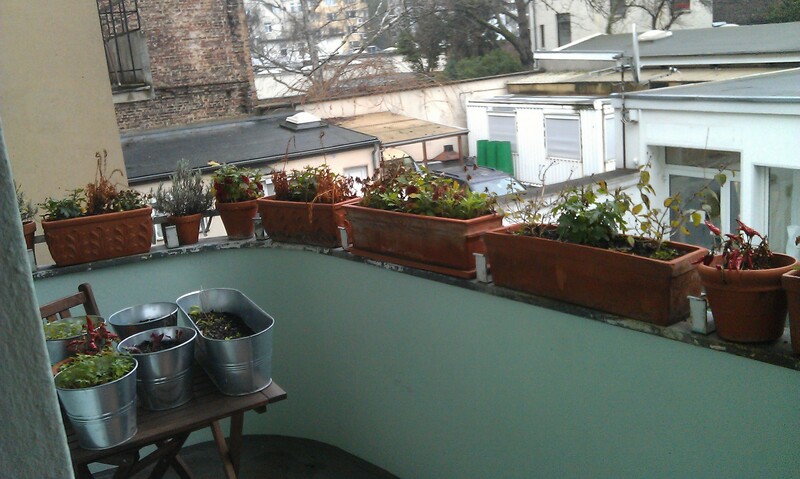 This entry was posted in Gardening and tagged Balcony, Winter by kathatravelling. Bookmark the permalink.